We have taken a look at the design concept of the Jazz. This 2nd article of our Fit/Jazz series takes a similarly close look at the new L-series engine which have been specifically designed to complement it. We take a close look at the L-series design concept and also the many new, advanced technologies used in its design. First however we take a quick tour of the different types of Fit/Jazz sold in Japan and around the world at the present moment, i.e. when this article is written. The Fit/Jazz have a couple more years to go for this current generation, so there will probably be new and interesting variants in the future. The extremely successful new Honda City, also called the Fit-Aria and Fit-Sedan is well known as the first variant of the Fit / Jazz. Various 'scoop' magazines in Japan, which specializes in coverage of new, yet to be launched cars have also been talking about other variants such as a Fit-Wagon and others. This series is on the Fit/Jazz so I will only be looking at Fit/Jazz. I will not attempt to list what types are sold in which countries as the Fit/Jazz is currently sold in more than 70 countries and so it is a futile exercise to try to do a comprehensive and accurate guide. To find out what types are sold in which country, the best method is to visit the website for the Honda office or representative in that country. The website url which will be listed (if available) at the Honda Worldwide website. All the various types of Fit / Jazz is powered by a variant of the new L-series engine. There are a total of 4 versions of this engine used : 1.2l, 1.3l and 1.5l, all SOHC i-DSI designs and finally a 1.5l SOHC VTEC version which is not i-DSI. Mated to these variants is a mixture of either the Multimatic (MMT) gearbox which is also known as the CVT outside of Japan and a 5speed manual gearbox. The MMT/CVT gearbox comes in both a plain 'vanilla' version as well as a sportier version equipped with a 7 speed mode where the gearbox ECU is programmed to run using 7 discrete, distinct ratios versus the continously variable ratio of its normal operating mode. First a clarification of the terms used in this article. I have tried to follow Honda's terminology in this article with the result that some terms might sound funny. But the benefit is that we will be consistent with Honda's naming convention and this makes it easier to understand their documentation. Honda uses the term model for a particular vehicle design. So the Fit / Jazz is one model while the Civic is another. Next would be what Honda calls a variant or alternately version. This is one particular format of a model, e.g. 5door hatch, 4door sedan, etc. So the original Fit is a 5door hatch variant. And the export version is called the Honda Jazz. Meanwhile, gaining a reputation as a very popular car worldwide would be the sedan variant, called the City, Fit-Aria or even Fit-Sedan in different parts of the world. Finally the type is a particular specification of variant sold. E.g. the JDM Fit equipped with a 1.3l Lseries engine is sold in three different types : 1.3W, 1.3A, and 1.3Y. So we have a Fit 1.3W which is one type, and the Fit 1.3A and Fit 1.3Y are two other types. 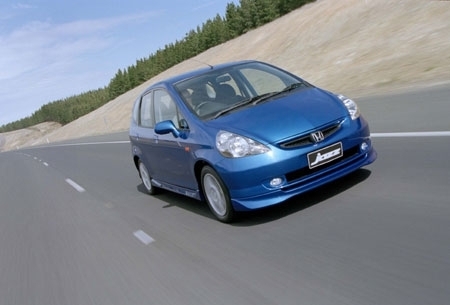 Similarly, the Fit 1.5 and Fit 1.5T are two different types which uses the 1.5l VTEC L-series engine. With this clarification of the terminology used, we proceed to the different types of Fit and Jazz sold around the world. 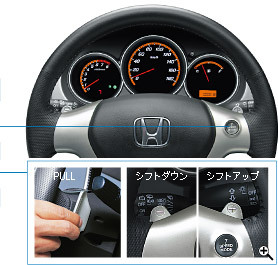 The most well know Fit / Jazz type will probably be the Fit 1.3 which was launched in Japan in 2001, i.e. the one which started the whole success story. This is a rather confusing type in a way with countries also marketing it as both a '1.3' and a '1.4' Jazz. Nevertheless, regardless of the confusing name, this type uses a 1.3l L13A engine. At the moment, it is mainly sold with the MMT/CVT though some countries like the U.K. markets it with the CVT-7 as well as a 5speed manual option. Rarely sold is a '1.2' type of the Jazz, equipped with a 1.2l L12A engine also in 8V SOHC i-DSI configuration. This type comes equipped with mainly the plain CVT. The original L13A Fit / Jazz attracted many enthusiasts and consequently there have been calls to Honda for a sportier model, one more tuned for performance rather than utility and economy like the original 1.3l Fit/Jazz. Japanese magazines, especially the very popular BEST MOTORing and Hot Version led the way with very 'powerful' reviewers like Keiichi 'Drift King' Tsuchiya and Akihiko Nakaya pushing Honda for a Fit Type-R.
Honda responded with the Fit 1.5 VTEC. This comes with the 1.5l L15A-VTEC which generates almost 30% more power than the original L13A engine. This type comes with either a CVT-7 or a 5MT gearbox option and Honda spec'ed and tuned the whole car around a much more sportier theme. Nevertheless, despite the best efforts by the drift king and gang, Honda still have not released a Fit Type-R.
A rather unique type was created by Honda R&D of Asia (Honda Research Thailand or HRT) based in Ayuthaya in Thailand. This uses the same L15A i-DSI engine as that used on the Honda City/Fit-Aria/Fit-Sedan and comes with both the CVT-7 and 5MT gearbox option. The Fit underwent its mid-term 'MMC' late last year in Japan with a redesigned front bumper and detail changes to the exterior, the use of discs for the rear brakes and a new re-designed steering wheel with paddle-based shifters to work the 7speed mode. More significantly, while there have never been manual JDM Fits, Honda finally launched 5MT JDM Fit in this MMC. The MMC have just started to make its way outside of Japan at the time of writing and as far as I know, Jazzes sold in Australia are one of the first to adopt this MMC. Having taken a look at the many different types of the Fit / Jazz around the world, I will now take a close look at the new Lseries engine. Designed by Honda to replace the Dseries engine, the Lseries is a new design for the global small platform / small-max series and is envisaged to be a leading edge design. The new L-series features some key innovative ideas. The benchmark against which the Lseries was designed would be the well-established D-series engine, what Honda identifies as the 'conventional VTEC unit'. The Lseries was designed to be smaller in dimension and lighter than the Dseries. It is also designed to be as efficient, returning equal or better fuel economies as well as acheiving lower emission levels. Unique too is how the Lseries is designed to complement an entire platform of Honda models, the aforementioned 'Global Small Platform'. The key characteristics of this platform has already been covered in our previous article on the design concept of the Fit/Jazz. The Lseries engine is designed to help enable the realization of these characteristics. One of the most important characteristic of the GSP would be the so-called 'space efficiency', i.e. extraction of maximum interior cabin space out of the small design and the key to it is the short engine bay. Thus the Lseries is designed to fit into a short and small engine bay. The Lseries of engines are designed to be super compact engines to enable the design of short and small engine compartments in Honda's new 'global small platform' or their 'small max' series of subcompact designs. External dimension wise, the Lseries is some 118mm or over 4.5 inch 'thinner' and 69mm or over 2.7inch shorter (including gearbox) as compared to the 'conventional 1.5l VTEC' Dseries engine. The thinner engine profile is most crucial as the Lseries are transversely mounted and so its 'thickness' directly impacts the depth of the engine bay. Actually the difference in maximum thickness does not convey the true acheivements made by Honda's engineers with the Lseries. The comparison of the actual engine profiles, between the Dseries and the Lseries on the right shows how much narrower the Lseries is overall. The Lseries weighs some 10% lighter than the Dseries. A key element to the thinner engine is a new much more compact SOHC cylinder head design, achieved with a much smaller angle (30degree vs 46degree) between the intake and exhaust valves. This allows a narrower head and also enables a smaller, more compact combustion chamber which was necessary to enhance more rapid combustion of the air-fuel mixture. This is done by a novel way of combining the axles of the intake and exhaust rocker arms. The top photo on the left is a line drawing of the Dseries valve train. Note that each train of rocker arms, the intake and exhaust, have an axle of their own and the tip meets in the 'middle' to rest on the single centrally mounted camshaft. In the Lseries, the two trains of rocker arms are moved inwards towards each other. Now a single common axle is used by both train of rocker arms, located directly on top of the single camshaft. The rocker-cam contact points are now on opposite sides to each other. The L-series intake and exhaust systems are new highly efficient designs. The intake manifold is a long runner design to obtain high torque in the low and mid rpm range. It is made up of an advanced tough plastic to ensure lightness of the structure and also easy installation on the cylinder head. In most engines, the intake manifold extends outwards from the cylinder head. In the L-series, the narrow cylinder head design frees up space for the intake manifold. But a long runner manifold would take up a lot of space anyway. So the Lseries intake manifold curves up and over and puts the plenum above the engine. This helps maintain the narrow profile of the Lseries by exploiting the vertical element of space. Being narrow at top also makes access into the engine bay for service or repair much easier and improves air circulation and thus engine cooling as well. To enable the delivery of similar or superior fuel economy to the Dseries, the Lseries features technologies that lowers internal friction. The purpose is to reduce power loss to internal operating friction and thus to extract more useable power from the combustion of the air-fuel mixture. A non-comprehensive list of technologies employed for this end follows. 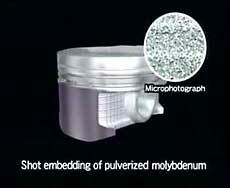 The piston skirts are coated with 'pulverized molydebnum'. Molydebnum coated piston skirts are first used on the famous B18C Spec R engine on the 1995-2001 DC2 Integra Type-R. In the case of the Lseries, the molydebnum are first 'pulverized' into powder form and then embedded into the piston skirts using a high pressure shot. The molydebnum enhances the 'lubrication' between the piston and the cylinder liner walls, adding to that which is already provided by the engine oil and this greatly reduces internal power loss through friction in this area. Honda says this is a world's first. the cylinder shaft (con-rod) and crankshaft are offset. 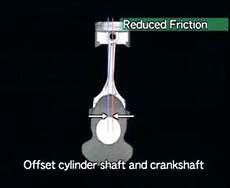 What this means is that the cylinder is not directly vertically overhead of the crankshaft. It is offset to a small degree, to one side of the crankshaft. So when the piston is at TDC, the conrod is not at an exactly vertical position but is already slightly slanted. When the air-fuel mixture burns, the power stroke now has a better 'leverage' on the crankshaft and this helps to extract more power out of the combustion. 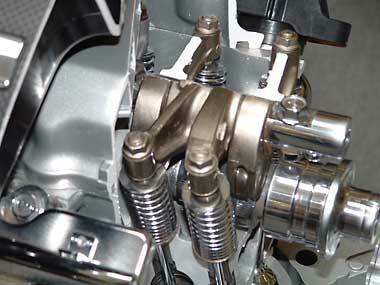 The timing chain tensioning mechanism is a 'blade spring cam chain tensioner' system. The exhaust pipes are made of stainless steel in order to reduce both weight as well as heat loss from the exhaust gas. This heat conservation property helps to rapidly boost the temperature in the catalytic converter and results in a faster warm-up and thus cleaner exhaust emissions. 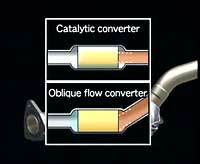 The catalytic converter itself is connected to the downpipe from the engine at an oblique angle (see diagram). This has the effect of guiding the exhaust gas into the cat at an oblique angle as well. This oblique angle increases the contact area between the exhaust gas and the catalyst inside the cat to enhance cleaning efficiency and thus reduced emissions. The Lseries employs EGR for lower emissions. EGR works on the principle that at light to medium light operations, power demand is very light. Rather the engine runs steadily and fuel economy and low emissions is the key. What EGR does is to re-route part of the exhaust gas back into the combustion chamber, to be mixed with the fresh air-fuel mixture and then the whole mixture reburned again. This has the effect of recovering the unburned fuel that is often discharged into the atmosphere as emissions. The overview so far takes a look at the Lseries engine as a whole. As is well known, there are several variants of this Lseries engine. However, they can be broadly grouped into two categories, based on the specific technology implemented in the cylinder head. These two catagories are either L-series i-DSI or L-series VTEC. Each technology has specific goals and acheivements and we cover both of them in turn. 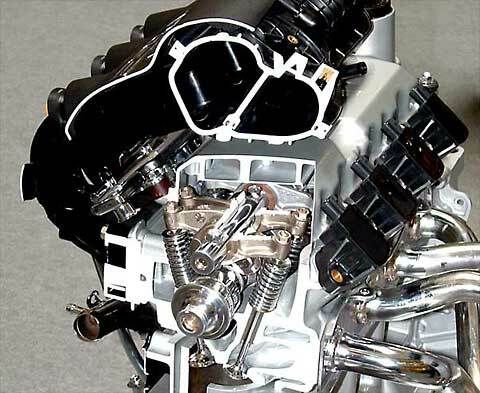 The key configuration for the L-series i-DSI engine is that it is a small, thin profile, inline-4, 8-valve, SOHC design with two spark-plugs per cylinder. Because of the SOHC and especially the 8-valve (2-valves per cylinder) design, the original L-series, L13A and L15A i-DSIs were subjected to a lot of prejudice and ridicule. This stems mainly from the fact that modern day engines have since become multi-valve designs with the higher spec'ed ones being DOHC. So the view is that for an I-4 engine, 16V-DOHC with EFi is the indicator of an advanced engine and therefore 8V-SOHC is considered 'old' technology. This of course is totally wrong and here in this article, I hope to explain that the Lseries is actually a very advanced engine design. Honda has very good reasons for adopting the particular technologies and configurations used in its design. Many points in this article are extracted from a special media-only video presentation of the new i-DSI L-series engine. Here Honda explained that the design objective of their new 'L-series' gasoline engines is that of achieving complete combustion, i.e. a combustion efficiency of 100%. This 100% efficiency is explained as 'complete burning of the air-fuel mixture without wasting a drop (of fuel) and converting all the energy of the combustion into kinetic energy'. A 100% efficient combustion is of course seldom if ever achieveable in real life. In order to improve combustion efficiency, Honda seeks to optimize the combustion process itself. The ideal combustion process is instanteneous combustion where the efficiency of the conversion of combustion energy to kinetic energy is complete. To approach instantaneous combustion Honda implements a dual approach : a 'remarkably intensive combustion' and 'combustion control adjusted to engine speed (rpm)'. In the L-series, these are delivered by its compact combustion chamber and the new i-DSI system. Firstly, the rationale for an SOHC design has more or less been explained in the previous section. The use of a single axle for both banks of rocker arms allows a very narrow cylinder head and reduces the angle between the intake and exhaust valves and this creates a compact combustion chamber. There is a good reason for this obsession for a compact combustion chamber. During combustion, the greater the expansion coefficient, the greater the amount of kinetic energy extracted. Kinetic energy is of course what moves the pistons. So Honda set the goal to compress the AF mixture as much as possible, i.e. to increase the compression ratio as high as possible. The L13A i-DSI runs with a CR of 10.8 which is extremely high for an engine of its class. And this very high CR is what enables the intensive combustion process. Honda's OHC engines have 'pentroof' combustion chamber designs. This means a domed combustion chamber. When the intake & exhaust valve angle is large, the dome have to be higher. The higher dome creates a larger combustion chamber which lowers the CR. In the older engines, Honda makes pistons with domed tops in order to reduce the effective combustion chamber volume to get a higher CR. In the L-series however, the smaller valve angles makes the dome lower and this directly makes the combustion chamber smaller. So the very high 10.8 CR can be achieved without resorting to messing around with the piston top design. This is important because in the L-series, Honda has another task for the piston top. One problem, a huge problem, with a very high CR is that it induces knocking / detonation. This is the process where parts of the air-fuel mixture spontaneously ignites before the flame from the ignition started by the spark plugs arrives. Detonation affect engine vibration, noise, durability, and will cause the engine to deliver less power. To enable this high CR and to reduce or eliminate detonation/knocking, Honda developed the new i-DSI system. This newly developed i-DSI system intelligently controls 2 spark-plugs per cylinder and seeks to 'speed up' the combustion process and to eliminate detonation. As a result, i-DSI directly enables the engine to deliver ample torque at all rpms, ultra high fuel efficiency and clean emissions. i-DSI seeks to speed up the combustion of the air-fuel mixture by using two sparks to ignite the air-fuel mixture. Actually speed-up is a misleading term. When the air-fuel mixture burns, it always burns at the same rate. However what i-DSI seeks to do is to reduce the time from igniting the mixture to the time the entire mixture is burning. After the air-fuel mixture is ignited, the flame front starts propagating outwards to the rest of the mixture. Pressure builds up as the flame front expands and maximum combustion pressure is acheived roughly when the whole air-fuel mixture is burning. This creates two requirements/problems. Firstly because the combustion pressure is what is pushing the piston downwards, we want to time it so that we can exploit the pressure build-up sequence, especially timing the point of maximum combustion pressure to the optimal position of the piston on its down-stroke so as to maximize the conversion of the combustion energy into downward motion energy of the piston. This is the process of 'converting the energy of the combustion into kinetic energy' that Honda stated. To get an understanding of the importance of this timing, a very good analogy would be the process of pushing someone (say a kid) who is on a playground swing. The person on the swing will always yell to go 'higher'. To do this, there is an optimum point at which to push on the swing so as to get it going at maximum speed and thus maximum elevation. Push too early and one will actually slow down the swing or even make it stop. Or wait too long before pushing and one finds the swing moving away faster than one can push. So the optimum timing is important when pushing the playground swing and this principle also applies to the timing of the ignition which determines the point of combustion of the air-fuel mixture. One big problem with ignition timing is the fact that the rate of combustion of the air-fuel mixture remains the same irregardless of engine rpm whereas the speed at which the piston moves increases as the engine rpm increases. So in the standard single spark-plug design, the optimum timing point differs at different engine rpm, and we need to ignite the air-fuel mixture earlier and earlier as the engine rpm goes higher. This is the basis for advancing the ignition timing for high rpms. However two problems now occurs. 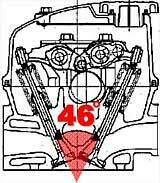 One is the combustion rate is no longer optimum with regards to the piston position, i.e. we ignite the air-fuel mixture so early that the piston might be on its upstroke and so part of the combustion pressure build-up will actually work against the piston's upstroke. The other issue is the large degree of ignition advance leads to detonation or engine knocking and this has the dual effect of reducing power as well as engine reliability as it stresses the engine. So the working principle of i-DSI is to reduce the time from initial ignition of the air-fuel mixture to the time of complete combustion and hence maximum combustion pressure. Basically in the standard 1 spark plug design, for Honda engines' case, the spark plug is mounted in the middle at the top of the combustion chamber. During the so-called 'power stroke' of the 4 stroke cycle, the pistons have already compressed the air-fuel mixture and the spark plug fires to ignite the air-fuel mixture. Now, the air-fuel mixture does not suddenly uniformly start burning. The spark ignites the region around it and the flame front propagates outwards from there until the whole mixture is burning at which point it would be producing the maximum combustion chamber. So the rate of the burning portion of the mixture does not change but what i-DSI seeks to do is to shorten the time between igniting the mixture using the spark plugs to the time the whole mixture is burning. To do this, i-DSI places two spark-plugs in a diagonally opposite configuration. In this case, the 8valve configuration is an integral part of the i-DSI design. 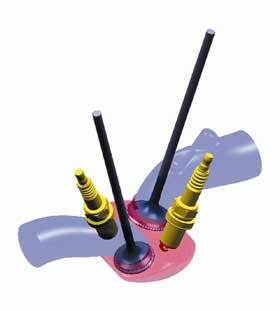 It enables the placement of two diagonally opposite spark plugs and this a important feature of i-DSI. This diagonal opposite position minimizes the distance the flame front must travel from each spark plug before complete combustion occurs. So the engine uses 2 valves per cylinder with the basic layout like the typical 4 valves per cylinder design except that one of the positions for intake and exhaust valves are now spark plugs instead. The diagram on the left shows this configuration. The idea of i-DSI is wonderfully simple. Say we have a rather large pile of rubbish or dry leaves and we want to burn it. What we might do is to use a lighted match or lighter and start one side burning. Now if the pile is really large, it would take quite a bit of time before the whole pile starts burning so what we might additionally do is to walk over to the other side and then light up that side as well. So we get both sides of the pile burning so as to speed up the burning process, to shorten the time needed for the whole pile to burn. I-DSI works by the same principle. Each spark plug ignites one part of the air-fuel mixture. Since they are positioned diagonally opposite, what this does is to get two diagonally opposite sections of the mixture to burn. The flame front expands and meets in the middle and the whole air-fuel mixture gets burning in a much shorter time. The actual timing of the firing sequence of the 2 spark plugs differs at different rpm, in order to optimize the ignition process. In the low rpm range, typical of city driving, the intake side plug ignites earlier and exhaust plug ignites later (compared to a standard 1 plug system), maximizing fuel efficiency and generates robust torque. In the mid rpm range, the exhaust plug ignites even later after the ignition of the intake side plug, optimizing power output in relation to engine speed. Finally in the high rpm range, both plug ignite early almost simultaneously, optimizing both power output and torque. In this way, i-DSI provides precision control of the ignition timing for all driving conditions, optimizing it for conditions such as at high rpm and high loads, driving uphill or accelerating rapidly, or high rpms and low loads, or cruising at high speed. This control helps to virtually eliminate detonation and enhances the efficiency of the combustion, helping to improve overall fuel efficiency and ample torque for its small displacement. Honda says that the combustion process in the L-series engine is about 30% more intensive than that of a standard single spark-plug system. The 8-valve design is not only required for i-DSI implementation, in the L-series engines, the off-set position 1 intake valve set-up also instills a swirl of the air-fuel mixture as it enters the combustion chamber. This offset placement of the single intake valve and newly designed intake ports and piston heads contribute to creating the optimum swirl which promotes more even mixture of the air and fuel and this helps deliver an very even and stable combustion. This stabilized combustion enhances torque and fuel efficiency and produces cleaner exhaust emissions. Again the idea of this is wonderfully simple. It is simply what we would do daily with that morning cup of coffee for e.g. Pouring the plain black coffee from the pot, we add one or two lumps of sugar, some milk and then we proceed to stir the coffee so as to mix it up thoroughly. So the 8valve set-up instills the swirl in the intake air-flow for the same purpose, to mix up the air and fuel thoroughly. This helps to deliver an even and more thorough combustion and is key to the class-beating fuel economy of the i-DSI designs. The i-DSI designs have relatively good low-end and mid-range power because of the 8V design and the i-DSI system. But the 8-valve design do hinder air-flow at higher rpms. This is not critical because the design objective of the i-DSI Lseries engines are to produce good power in the low and mid rpms and excellent fuel economy in that range too. Thus the engine's max torque peaks at a relatively low 2700rpm with max power a relatively modest 82-88ps in relation to the 1.5l displacement. The engine do feel like running out of breath when nearing its red-line, specifically after around 4500rpm but again, this i-DSI Lseries design is not targetting high-rpm power but rather good driveability. Most important of all, while I have been trying to explain that the i-DSI designs are exploiting state of the art technologies, misconceptions about it still abounds across the internet and many people simply fails to understand that preconceptions made based on the 8valve design as 'low-tech' are simply wrong and that the i-DSI engines are 8V for a very good reason. Having taken a close look at the technologies and implementation of the L-series i-DSI engines, I now take a close look at the L-series VTEC engine, i.e. 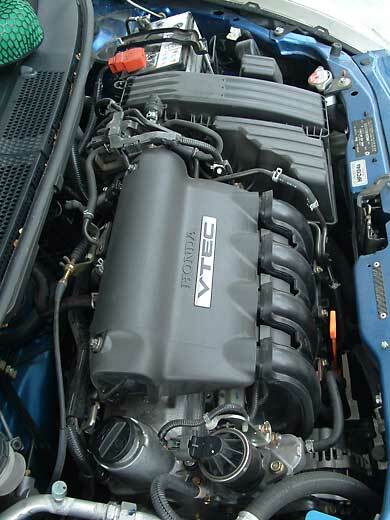 the 1.5l L15A VTEC as used on the Fit 1.5t and Jazz 1.5VTEC. The L15A VTEC seeks to retain as much of the fuel economy and low emissions of the i-DSI as possible while delivering a higher level of power for a higher performance Fit / Jazz. Most of the information in this section are extracted from a media-only presentation that was conducted during the media test-drive function held for the City VTEC launch late last year. The engine used on that car is more or less the same as that used on the Fit 1.5T and Jazz 1.5VTECs. Basically, the L15A-VTEC is an L-series engine at its core. This means that it exploits the technologies of a narrow cylinder head, high compression ratio, low internal friction, plastic intake manifold, molydebnum pregnated piston skirts, offset cylinder placement in relation to the crankshaft... in short, all the key technologies of the L-series engine. This gives it the ability to be almost as fuel efficient as the i-DSI designs. What it differs from the i-DSI design however is that it uses a 16-valve-train with VTEC instead of i-DSI in order to generate higher maximum power. 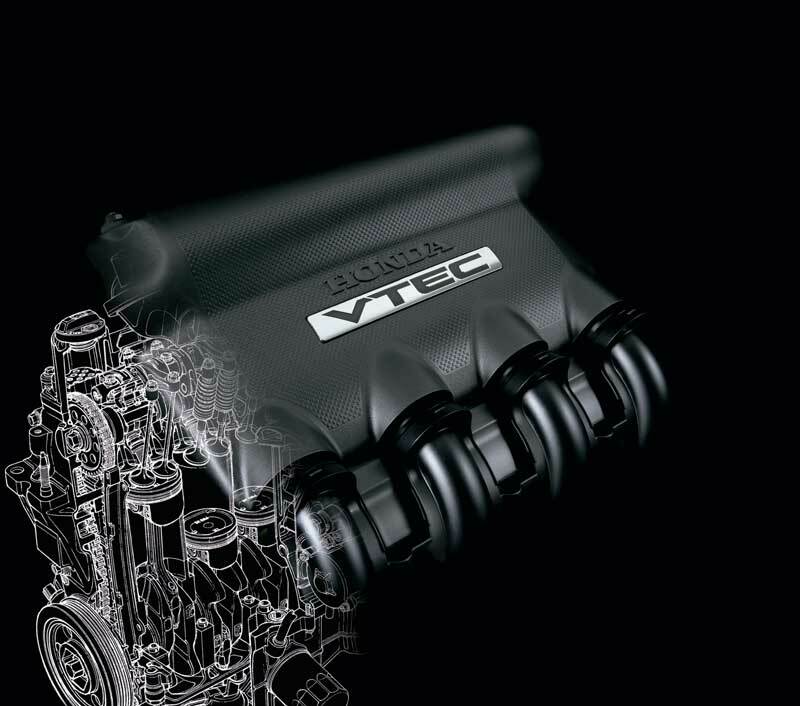 The City VTEC presentation calls the L15A VTEC 'the latest version of Honda's unique VTEC engine technology', emphasizing that it combines VTEC with new intake ports and technologies that delivers lower internal friction and that the objective is to deliver 'a high level of balance between dynamic and powerful performance and fuel economy at mid-to-high engine speeds'. So as can be seen, the L15A VTEC is now focussing on the mid and high rpm range as compared to the low and mid rpm range of the i-DSI versions. One good way to see the two variants of this L-series, the i-DSI and the VTEC is to see it as two different extremes of implementation: the i-DSI are extremes on squeezing maximum fuel economy while the VTEC extremes on squeezing maximum power output. Both of course are implemented on the L-series blueprint which is fundamentally a fuel efficient and low emissions design and which sets the overall physical bounds on what both i-DSI and VTEC can deliver. The VTEC mechanism on the L15A VTEC is that of a 1-valve/2-valve system for the intake side only. The exhaust side always functions as a 2-valve system. So the L15A VTEC is a 12valve/16valve system. Here again, misunderstandings and prejudice abounds. Firstly because the original B16A engine that pioneered VTEC was a 3 rocker/cam-lobe design, while the first 12valve/16valve VTEC implementation was on the VTEC-E D15B engine, many have since labelled the 12v/16v VTEC mechanism as the 'economy VTEC' version while reserving the 3-rocker arm mechanism as the 'true power' version. Again if taken too strictly, this is wrong. We must first understand the working principle of VTEC. In a naturally aspirated (NA) engine, the air-fuel mixture that enters the engine will always be at around normal atmopsheric pressure. In a 4-cylinder 1.5l engine like the L15A, this actually places an upper limit on the amount of air that can enter each cylinder, i.e. approx 375cc (actually slightly more) per cylinder. It's just physically impossible to move much more than 375cc into each cylinder. Of course all of this 375cc goes in through the intake valve(s) when they open during each intake cycle. Now the problem is again like the case of the air-fuel mixture combustion above, the rate of air-flow into the cylinder is more or less constant but the intake valves can only open for a certain portion of the 4-stroke cycle, basically when the piston is on its downstroke during the intake cycle. Because the piston speed actually increases as engine rpm increase, this means the absolute amount of time the intake valves can open actually gets smaller and smaller as engine rpm increases. So there is less and less time for the 375cc of air to get into the cylinder as rpm increases. 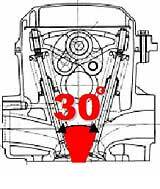 Since the rate of air-flow is more or less fixed, to ensure we get as much as possible of that 375cc of air into the cylinder, the only mean is to ensure the air-flow passage is large enough; i.e. we get a larger valve and/or we can open the valve more and/or longer, i.e. adjust the valve timing. But the physical properly of air-flow is such that when we optimize the valve size and timing for maximum air-flow at high rpms, it actually hinders that optimal filling of the cylinders at lower rpms. So for lower rpms, we want smaller valves or we lower the valve timing - open the intake valves less or shorter while for higher rpms, we want the reverse. In a standard non-VTEC engine, even those engines with normal variable valve timing mechanisms which only adjusts the relative position of the intake and exhaust valve opening cycle, we have to accomodate by compromising both valve size and valve timing in order to get acceptable performance in the low, mid and high rpms. Honda's VTEC system however is a mechanism that enables us to actually control the intake air passage so as to optimize air-flow at all rpms. If we look at this principle in relation to whether a VTEC mechanism is full 16valve 3-rocker arms or a 12v/16v 2 rocker system, then we can see that there is no physical law that dictates that one must be for power or the other must be for fuel economy. The 16v 3-rocker system adjusts valve timing whereas the 12v/16v system actually adjusts valve sizing. But both are merely different means to achieve the same end. I.e. the 12v/16v system actually works on the principle of increasing the effective valve size at higher rpms but valve timing remains the same whereas the 16v 3-rockers system works with a constant valve size but adjusts the valve opening amount and duration. Both works with the objective of allowing more air-flow into the cylinder. So in relation to the 12v/16v system, yes, the original D15B VTEC-E engine runs 12valve to enable lean-burn (or what some likes to call 'stratified charge') mode in order to run at very lean air-fuel ratios. But it is equally possible to implement a 12v/16v wild-cam VTEC system, i.e. either 1 or both intake valves are working off a very wild, racey cam timing. Indeed, a 12v/16v system is capable of almost doubling the size of the intake valve once VTEC 'opens' the secondary valve. Of course there is a physical limit to the absolute size of both valves (dictated by the bore of the cylinder) so the 12v/16v system is restricted by this limit in terms of increasing the effective valve size. But on the other hand, the 16v 3-rocker system has a lower limit in effective valve size eventhough it can adjust valve timing because both valves are always operating so it cannot deliver a very small valve size without impacting air-flow at high rpms. So ultimately a 12v/16v VTEC system will not be able to deliver the same power as a 16v 3-rocker VTEC system but it can be quite respectable too. Conversely, the 16v 3-rocker system will not be able to get anywhere near the fuel economy as the 12v/16v system but again it can be quite miserly in fuel consumption too. Honda did offer us the best of both worlds of course and that is in their incredible 3-stage VTEC D15B engine, an engine which has a VTEC system to offers 3-modes, a 12v, 16v and then 16v with higher valve lift and longer valve opening. It was indeed a technological showcase in its time. 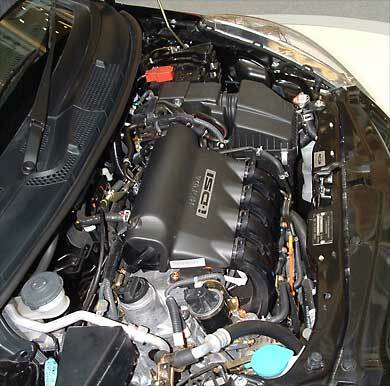 In the current generation of L and K series engines, that engine is effectively replaced by this L15A VTEC we are looking at now as well as the 12v/16v K-series engines. So the L15A VTEC uses a 12valve/16valve VTEC system. A nice by-product of a 12v/16v system is the offset placement of the intake valve during 12v mode and this gives us a nice property of inducing swirl in the intake air-flow besides enabling two effective valve sizes. At low-rpms, only 1 intake valve opens while the other is basically 'dead' or not operating. By using this with optimally designed intake ports and piston heads, a swirl is induced in the incoming air-fuel mixture and this helps to enhance the efficiency of the combustion just like in the i-DSI versions. It is not possible to achieve the same level of efficiency as with the i-DSI system of course, but it is good enough to enable the L15A VTEC to achieve almost the same levels of fuel economy as the older D-series engines, the VTEC-E and the 3-stage VTEC D15Bs. At higher-rpms both intake valves opens and the engine now operates in 16valve mode. During my test-loan of the Jazz 1.5VTEC from Honda Malaysia, I thought the switch to be at approx 3,500rpm based on the subtle intake note change. When this happens, it effectively doubles the size of the intake valve, enabling almost double the amount of air-flow into the engine. The nett result is much better mid-range and high-end power on the L15A-VTEC, allowing it to deliver 110ps or almost 25% more power than the equivalent L15A i-DSI unit. In operation, it does not feel like running out of breath at all when entering high-rpms. 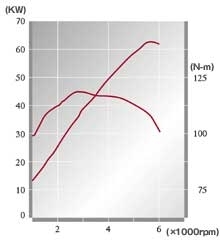 Subjectively, there is a nice power surge after around 4000rpm and the power curve published by Honda (on the left) actually shows this surge. 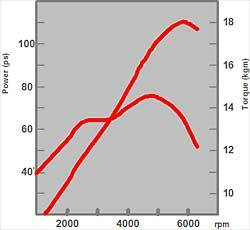 Indeed the profile of the power curve is not that much different from the B16A DOHC VTEC for e.g. which is supposed to be a 'true' 3-rocker arms VTEC engine. To enable this high level of power output, the exhaust system for the engine is actually upgraded in comparison to the L15A i-DSI system. So the rate of flow for the VTEC engine is now 55litres per second as compared to 50 litres per second for the i-DSI and this is achieved by increasing the diameter of the exhuast piping from 38.1mm to 42.7mm while the rear muffler volume is increased from 8 litres to 10 litres at the same time. As an interesting aside to this discussion, I did ask the Honda R&D engineers why the L15A VTEC did not implement both VTEC and i-DSI at the same time. Surely that would give us the best of both worlds, good maximum power with fantastic fuel economy, much like the incredible 3-stage VTEC D15B of old. I actually already knew the answer beforehand but it's still best to get the confirmation from the experts. The truth is the valve size on the L15A VTEC needs to be large in order to generate enough air-flow for the rather healthy output (110ps is as good as equivalent 1.5l DOHC performance oriented engines, most of which won't be able to deliver anywhere near the same level of fuel economy). So with 4 valves in each cylinder, there really is no space left to put anything more than 1 spark plug in, certainly no space to implement the diagonally opposite placement that is a key feature of the i-DSI system. I hope that I have now managed to explain to readers the technologies that Honda have put into the much maligned L-series engines. As I have taken great pains to emphasize in this article, the new L-series engines, whether i-DSI or VTEC are state of the art designs. 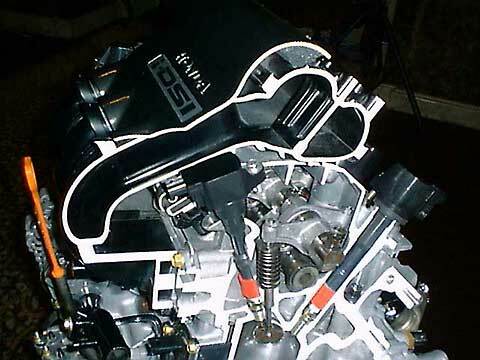 More importantly, they have unique characteristics and technologies all designed to meet specific design objectives; the SOHC 'narrow' cylinder head design, the 8valves configuration of the i-DSI, etc, all have very specific objectives in the design. And above all, the crucial targets of the L-series, be it i-DSI or VTEC are a small, thin engine profile to enable the short small engine compartment, low emissions and a class leading fuel economy. 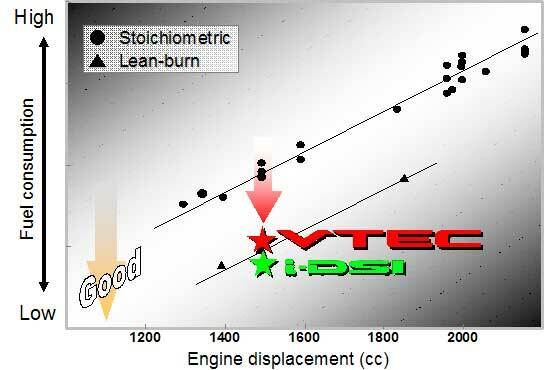 The primary target, which was met handsomely, was to acheive similar levels of fuel economy from the Lseries via conventional stoichometic combustions as compared to the VTEC-E and 3-stage VTEC Dseries which are lean burn (or so called 'stratified charge') engines. The key measurement is deemed the standard '10.15' mode commonly used in Japan for measuring fuel economy. This is a pre-defined sequence of on throttle, off throttle and light throttle cruising in controlled testing conditions which is designed to emulate typical day to day driving. The original 'grandfather' D15A with VTEC-E used on the EG4 Civic ETi was rated at 20.5 km/l for the 10.15 mode. The EK3 Civic VTi/Vi, using the legendary D15B 3-stage VTEC engine is rated at 20.0 km/l. These two engines exploits lean-burn technology to obtain this tremendous level of fuel economy. The L13A on the other hand is rated at 23 - 24 km/l for this 10.15 mode, i.e. better fuel economy than any D-series engine have ever delivered, including the lean-burn variants. The L13A is of course a 1.3l engine with lower power and so has an advantage from its displacement. But the larger L15A i-DSI which is of a similar 1.5l displacement to the original D15B VTEC-E engine and comparable power is rated at 20 km/l which is almost as good ! The L15A VTEC on the other hand has a similar 1.5l displacement and comparable power to the D15B 3-stage VTEC (110ps vs 130ps). Their 10.15 mode ratings are 19.2-20.5kml and 20.0km/l respectively. So as can be seen, Honda's single most important design objective with the L-series engines, that of achieving similar levels of fuel economy from stoichometic combustion as from that of a lean-burn engine has been handsomely met ! 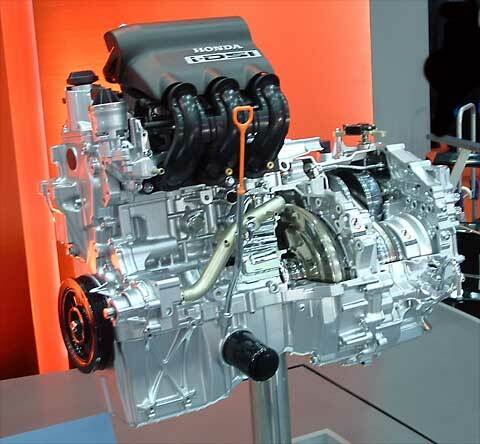 Honda's new L-series engine is perhaps one of the least understood engines in the current engine line-up. With this article, I hope to have helped explained the key feature of this new state of the art engine design and in the process, hopefully to clear up any prejudice and more importantly to put an end to many baseless conjectures that have been made about this engine as well as possible future variants. In the next article of this series, I will present the results of my findings and testings of the performance of the Jazz 1.5VTEC or Fit 1.5T.